Three foreign scientists given the international scientific cooperation award by China's top science academy on Thursday praised Chinese scientists' international cooperation spirit and China's scientific research environment. 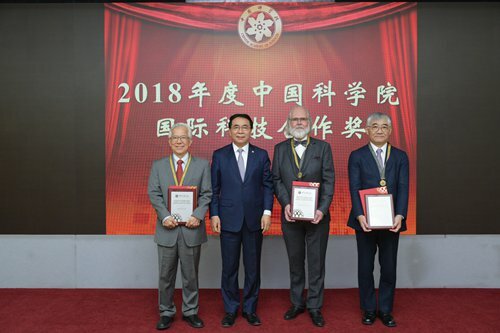 Bai Chunli, president of the Chinese Academy of Sciences (CAS) in Beijing, awarded medals and certificates to the three foreign experts in fields including mechanics, education, biology and climate change. Shih Choon Fong, an educator and fracture mechanics expert from Singapore, enabled academy undergraduates to study at the world's leading universities such as Massachusetts Institute of Technology and Oxford University, through promoting international educational exchange. Nils Christian Stenseth, a Norwegian biologist, has cooperated with CAS for more than 20 years and helped break through the traditional understanding of the relationship between climate change and disease epidemics. Japanese hydro meteorologist Toshio Koike has contributed to improving CAS observation and research ability on the Qinghai-Tibet Plateau. They told the Global Times on Thursday that the award was a recognition of joint work with their Chinese colleagues in the past decades. Stenseth told the Global Times that he liked collaborating with Chinese scientists as China has a good surveillance system for wildlife diseases, mass research data and financial support for science. In his field, Stenseth said that climate change, specifically global warming, could affect diseases. "China is likely to see more human cases of infectious diseases, such as plague and Dengue fever due to climate change," he said. Dengue fever, a viral infection transmitted by mosquitoes, hit China hard in 2014, as the country reported more than 27,000 cases and six deaths as of October 2014, according to a 2014 report from Xinhua News Agency. Koike told the Global Times that since 1991 collaborative projects with Chinese scientists mainly focused on studies of water circles on the Qinghai-Tibet Plateau. Koike said that scientific understanding of water resource management and flood risk should aid flood control, as climate change has seriously affected flood and draught in Asia. The ever-growing glacier retreat in Asia, including the Qinghai-Tibet Plateau, may lead 50 years from now to climate refugees and affect the lives of more than 1 billion residents in China, Pakistan, India, Iran and Kazakhstan, Yao Tandong, a glaciologist and CAS academician told the Global Times earlier. Observational capacity should be improved in cooperation with more countries surrounding the Qinghai-Tibet Plateau, Koike said. In future, Stenseth said that humans may be able to bring back animals extinct for millions of years, such as dinosaurs recreated them through genes extracted from animals that died long ago. But like the gene-edited babies scandal last year, such experiments require strong ethical regulations to decide what should and should not be done, he warned. The CAS Award for International Scientific Cooperation was launched in 2007. So far 34 foreign experts have won the award. Through recommendations, 24 have also won the China International Science and Technology Cooperation Award. Two of the five winners of this year's China International Science and Technology Cooperation Award - Peter G. Brewer, a US marine chemist, and Yimei Zhu, a US condensed matter physicist - were recommended by the academy.